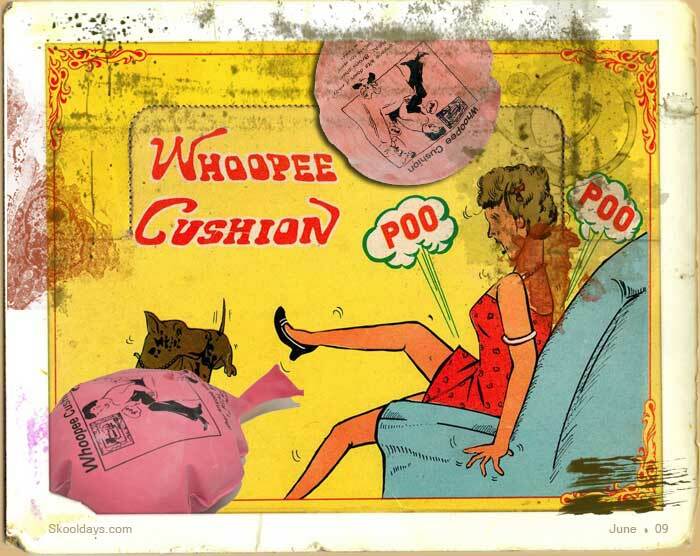 This blog wouldn’t be complete without the good old Whoopee Cushion. The joke was funny once and once only. Ten out of ten for novelty factor. Whoopee Cushions Poo-Poo Cushions or even Raspberry Cushions were a practical joke toy that has withstood the test of time and still raises a chuckle today (for the first few moments). So how did this bag of wind work and how did it ever become available on the market?Well it were down to a worker experimenting with off cuts of rubber in a Canadian factory back in the 1930s. No more than two sheets of rubber glued together round the edges, with a hole at one end to allow air to enter and keave. In effect it replecates quite well the exact problem that makes passing wind a noisy affair! This mechanism then creates the loud windy noise that so many of us have fallen victim to over the years, when a joker boy turned up for the evening. Mischievious children and adults acting as if they were 12, went round picking on unsuspecting victims with the Whoopee Cushion, deftly sneaking the air-filled sac onto their chair just as they’re about to sit down. And, parp! For some reason they always had a kind of talculm powder residue and they stunk of rubber. So unless you were deaf, dumb, blind and your nasal passage blocked you should never really of been caught out by one. The best time was when my big nan came round to our house, lets put it this way we had hours of whoopee cushion fun without the whoopee cushion! This entry was posted in Pop Culture, Toys and tagged 1930, 1940, 1950, 1960, 1970, 1980, 1990 by Skooldays. Bookmark the permalink.